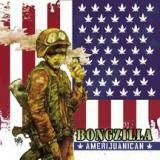 Bongzilla – another band name that deserves Nobel-esque recognition for sheer ingenuity. The title caught my interest immediately although I wasn’t exactly baffled on what kind of music one could find off an album which has cover art depicting the star-spangled banner with jazz grass leaves instead of stars. Massive helpings of grooving stoner with hints of sludge and even punk is on the menu. The opening riffs of the title track reveal the biggest influence of Bongzilla right off the bat: complete Black Sabbath-worship. Several riffs actually kick mucho buttocks like the very groovy intro of Kash Under Glass. It’s a shame that the album doesn’t really stray from a slow- to mid-tempo range, as the lack of fast tunes drags the album down too much. My favourite track is the gargantually jamming Stonesphere, all twelve-and-a-half minutes of it. I’m a sucker for the voice-box effect, so the band gets big points for using it well. I gotta mention singer Muleboys quite monotonous voice, which turned me off after a short while. The best depiction that came to my mind was that if Ozzy (Sab-era) got a serious throat infection and gargled the lyrics, you would get this dude. Or wait a minute, I got it! For those of you who have seen the cinematic masterpiece that is Monty Python & The Holy Grail: The singer sounds just like the creepy keeper of the Bridge Of Death. Only a bit pissed off. With better production and more effort in the vocal department I would have liked Bongzilla’s fourth studio album a lot more. The potential is clearly there and with refinement, great results are more than possible. As it is now, I think anyone that has inhaled a couple of bongfuls could appreciate Amerijuanican.